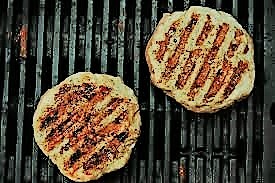 Turkey Burgers – Great for the BBQ! Heat a little oil in a large frying pan and sauté leeks for about 5 mins until softened. Remove And allow to cool and then mix with the remaining ingredients. Form into 8 balls & flatten into burger shapes. Place on the BBQ and cook for about 10 minutes until cooked through, turning half way through cooking time to brown on both sides.